I first visited John Hume at his 8000 ha “Buffalo Dream Ranch” in 2014 and have subsequently made two further visits, the last in May of this year. On the first day of my arrival, John said that two male rhino calves had been born the previous day. A little later, the radio crackled to say that another two male calves had just been born. John proudly showed me his ranch and explained in fine detail the inner workings of his breeding project. Before I continue, I need to address one mis-perception. Critics have categorized the ranch as a feedlot and the husbandry as intensive. This is absolute nonsense. Although I saw more rhino in a single day than I will probably see again in my life, they were all wandering around perfectly freely, dotted on the plains and almost every cow had a calf at foot. 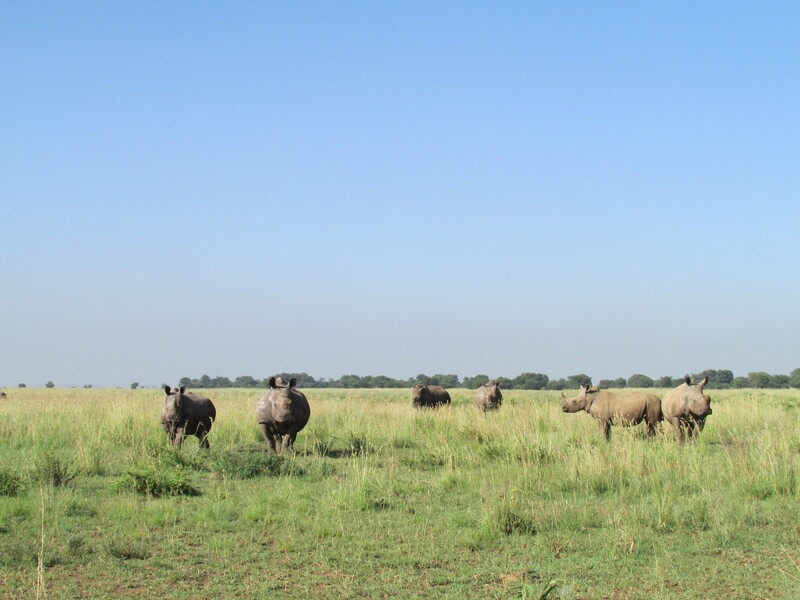 During this visit John confirmed that there were in excess of 1600 rhinos on his ranch making it an average of 5 ha of grazing per animal. Supplementary feeding is provided in the non-growing season and hay is made on the ranch and used during these periods, but in the growing season no additional rations are necessary. John was driving the old double cab with his energetic Jack Russells hopping on and off his lap and bouncing around the car. The ranch is divided into a number of large 400ha “camps” with more than just rhino and each one could be likened to Jurassic Park, with giraffe here, sable over there, eland, buffalo and a just about every antelope you can think of appearing from the grass or around the next bend. (Photo-tourists would probably love it, despite the fences). The “camps” themselves are also sub-divided to enable rotational grazing. During our drives, John’s frustration with policies out of his control was very evident. He said that despite the huge amount of money he puts into the project and the obvious breeding success he is having, it seems as if everything is set against his project being able to continue. It’s simply inconceivable that he is expected to fund this project from his own resources while simultaneously being deprived of his ability to generate any significant income from it. The most horrendous prospect for John is the looming probability that his funds will run out before legislative change enables him to generate sufficient income to allow him to keep going. In this eventuality, it would be difficult to see any future for the project and all his rhino would be placed in jeopardy. He has long claimed that legal trade in rhino horn will save his project and his rhino. Through the same logic, if the trade were legalized, other private rhino owners and the State Parks could benefit from an income which would enable them to protect their rhino. Rhino horn regrows after it has been cut off. (approx. 1kg per year for bulls and 0.6 kg per year for cows). A single bull rhino can produce at least 60kg of horn in its life time but if killed by poachers, an average of 7kg. The rhino cows may produce less horn, but they should produce 10 or more calves in a lifetime. If the Buffalo Dream Ranch is able to continue, the project will double rhino numbers every 8 years. South Africa has brought the White Rhino back from less than 50 animals to over 22000 today.It is now seeing the trend reversed due to the restrictions on marketing its rhino products. A combination of intensive anti-poaching measures and extensive rhino ranching has proven to be a highly efficient way of propagating the species. The philosophy of pure protectionism and forbidding sustainable use, prevents communities who are involved with rhino populations from developing incentives which are mutually beneficial. Protectionism has, so far, resulted in trade prohibition but this need not be the case. Legal trade in rhino horn does not call for the death of any rhino, so they could still remain protected. Protectionism without legal trade is not proving successful. There is a need to make a rhino worth more alive to its custodians than dead to criminals. Since the domestic moratorium on horn sales, there have been 8000 poaching-related rhino deaths. Consumers would probably prefer access to legally-acquired authentic products as opposed to illegal goods. In the absence of a legal supply, criminals have free rein to capitalize on the illegal market, driving prices up to astronomic levels and consequently making poaching far more attractive. A trade ban deprives resident Africans of legitimate economic opportunity. Already, security worries and lack of income potential from rhino have resulted in their removal from 2000 sq km of range. Without rapid adoption of legal trade, rhino disappearance from non-formally protected areas will continue to escalate. Intense rhino poaching has resulted in the useless deaths of rhinos and of people and will have negative effects that will last for generations. Nature conservation policy has never involved, and should never involve, the killing of people except in extreme circumstances. Donor fatigue and compassion fatigue are very real concerns. The anti-poaching measures of State Parks are heavily reliant upon foreign donors. Legalization of trade would make them self-funding and turn rhino from liabilities into assets. Since my first visit in 2014 to meet John Hume, I have become more actively involved in conservation work and, with support from some of the “old guard” from Natal Parks Board, I feel morally obliged to take up the cause and push for the legal trade in rhino products. To me it is only logical and if we are unable to make the changes at CITES, the future of our rhinos is very bleak. To lighten the mood, as I was driving away from Buffalo Dream Ranch after breakfast on my last visit, I received a call from John to tell me that two female calves had just been born and as I drove towards Botswana I pondered their future and that of the white rhino in Africa.